Seriously, if you aren’t drooling over this pizza then there is something wrong with you. I’m not even sure we can be friends anymore. This combines everything I love into one amazing dish: squash, bacon, arugula, PIZZA! Oh man. Much like the pizza above, this dish has e’rythang going for it. And I just happen to have e’rythang in my kitchen right now to make it, sooooo…. yum! If you heart quinoa and Brussels, this is totally the recipe for you. My go-to recipe for acorn squash is always to make it stuffed. It’s so easy and tasty. Make this one, with the addition of beans and corn, or just clear out the fridge and mix whatever you’ve got into the flesh with some breadcrumbs. Really, it’s just that easy. Nothing much beats a good curry, in my opinion. The fact that this recipe is quite healthful makes me smile on the inside. You may know that I have an affinity for Middle Eastern cuisine. I used to have a kilo of za’atar that I never knew what to do with, unless I was making sfeeha pizzas. Here is a recipe to use up that za’atar and tahini that you bought once and never used again! It’s also quite economical (minus the pine nuts!). Of course, squash isn’t just for side dishes and vegetarian mains, they can also be for dessert. Here is a recipe to satisfy your sweet tooth. Throw in some nuts and sultana raisins and you’ve got king of a morning glory coffee cake! If you don’t have any of the leftover squash and bacon pizza to have for breakfast, then here is a great alternative. Anything tastes good in a quiche, but this combination would be bursting with flavour (especially since it calls for blue cheese!). What kind of recipe roundup would this be if I didn’t include a pasta recipe? Here’s an easy one to whip together for a weeknight dinner. And, it’s a one-skillet wonder, which makes it even better because who likes doing dishes anyways? 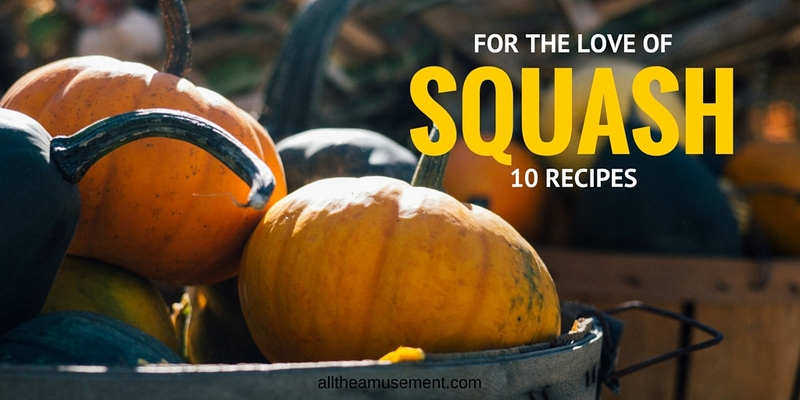 If you love squash as much as I do, make sure you try out a few of these recipes. Tell me what you think, and tell me what your go-to is when you have one sitting in the cellar.